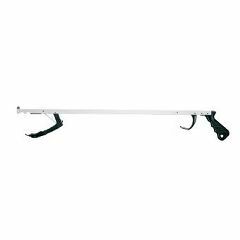 Carex 32" Metal Reacher helps users with weakened strength to grasp items from hard to reach places. They have magnetic tips to aid lifting small metal objects. My wife had back surgery and could not bend over. She used the "Reacher" almost entirely to pick up clothes from the floor and to help put on socks and slippers. To my knowledge she has not picked up heavy objects like cans of food nor has she used the magnetic tip. However she often uses the little post like hook on the tip to pull on slippers. She likes her "Reacher" so much that she recently bought one for her 92 year old mother who uses and likes hers as well. My wife was very sick 10 years ago which resulted in the amputation of her fingers. She was left with her thumbs and the first joint of her fingers. Despite this handicap she has no problems using her "Reacher". [...]. The product is doing the job for which I purchased it.